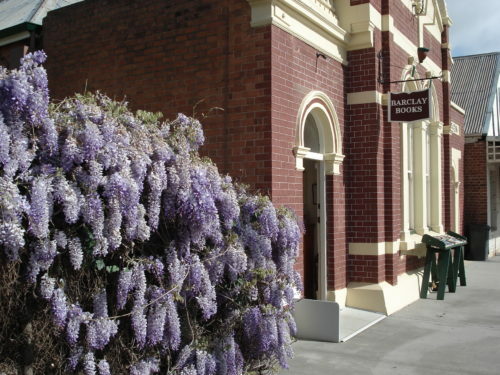 In February 2016 Clayton and Barbara opened Barclay Books in the historic Western Australian town of York. It was a change in direction for the couple after 13 years of ownership of the Dymocks store in Perth's Hay Street Mall. York was settled in 1831 and is the oldest inland town in WA, located approximately 100km east of Perth in the WA Wheatbelt. York's modest population of 3500 people is supplemented by the influx of tourists who are drawn to the heritage buildings. To provide for their mixed clientele, comprised of tourists, locals, and online buyers, Barclay Books stock a range of new, used, and antiquarian books. Their inventory includes 30-40,000 titles housed in their shop which is locally known as the Old Fire Station and was originally the York Municipal Chambers. Barclay Books chose to subscribe to Circle on the condition that we created a simple way for them to list the used and rare books from their inventory on ABE Books. Clayton, Barbara, and their website developer worked closely with Warwick to create the ABE integration we offer to our customers today. "We were very happy with both the process and the final result. The ABE integration is seamless for us on a day to day basis. In over two years we have only ever had one data upload problem and as soon as that was identified Circle were very prompt at rectifying it." Second-hand booksellers have the capacity to use multiple sales platforms and a generally vast audience, both topically and geographically, which places a greater value on online customers. Once a book is entered into a shop's stock system, selected titles can then be uploaded to ABE Books and shops will be notified of purchases in real-time. "We also have an inventory of our second-hand books for customers who come through the door and the increasing number of customers who access our own website. Without this easy access to this information we would miss many sales." A further beneficial feature of Circle Software is that once a book is scanned into a bookshop's inventory a suffix determining the condition of that copy can be applied along with any special notes. This reduces the amount of time a shopkeeper spends completing menial tasks, like data entry, and maximises the number of books they can advertise. Circle is a service designed to help your bookshop thrive. "Circle is invaluable to my business and is one of the best business decisions I have made to secure the long term growth of the business." Do you sell second-hand titles and want to see if Circle could work for your business? Send an email to sales@circlesoft.net to find out more.